The storied city of Istanbul comes alive in a lovely exhibition of historic and contemporary images currently on display at the Aga Khan Museum until June 26, 2016. A City Transformed: Images of Istanbul Then and Now gives us access to the private collection of Turkish art philanthropist Ömer M. Koç. Nearly 70 photographs, albums, and panoramas from Koç’s collection visually document the architecture, monuments, and people of this historic city. The earliest images date from the 1850s to 1880s, when travelling and local photographers aimed to obtain the Ottoman Sultan’s tuğrâ (monograph) on their albums. 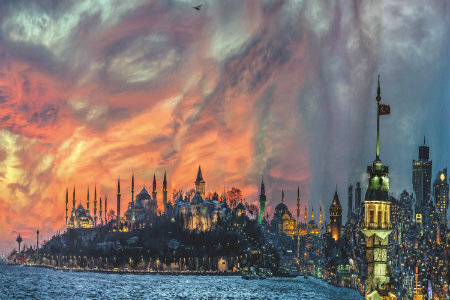 Alongside the images from Koç’s collection, we see new photographs and digital animations by contemporary Turkish artist Murat Germen. These modern photographs add contrast to the older images in era, scale, and scope. Germen’s cityscapes were created specifically for this exhibition; some of which are to respond to Koç’s collection of historical panoramas. The result is intriguing visually and conceptually. 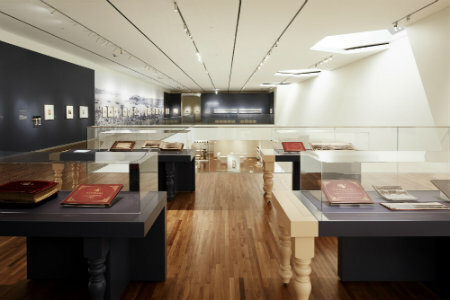 The exhibition is co-curated by the Aga Khan Museum’s Dr. Filiz Çakır Phillip and Bahattin Öztuncay, one of today’s leading scholars in the field of Ottoman photography. A City Transformed will be a Primary Exhibition in this year’s Scotiabank CONTACT Photography Festival. • Gorgeously-preserved albums of 19th-century photographs bearing the Sultan’s calligraphic monogram which were offered as diplomatic gifts. As part of this exhibition, next Thursday, March 24 at 1pm, you can join Dr. Irene Markoff (Department of Music, York University) for an illustrated talk and demonstration of A City Transformed. Also highly recommend taking a walk through the Abbas Kiarostami: Doors Without Key exhibition, which ends March 28, 2016. There is a film series that goes along with this exhibit co-presented by TIFF. For more information on both exhibits, ticketing, and box office information, please visit agakhanmuseum.org. *All images by Janet Kimber.